Moluccan cockatoos are affectionate birds that bond strongly with their owners, thriving on the social interaction. It's a rather cuddly bird that can even be a little clingy at times. As pets, they really want to be just as close to their chosen person as they would be to a mate in the wild. This parrot stands out from the rest because of their salmon-pink feathers and brilliantly colored crest. Their beauty rivals their boisterous, comical personalities, but they need an owner who is completely dedicated to them. This species is native to the Moluccas (Maluku Islands) in Indonesia. They live in the lowlands and form large flocks, sometimes becoming a nuisance to farmers. A pair of Moluccans will mate for life and separate from the flock during the breeding season. It's known for a wild Moluccan to become very depressed after losing a mate. Due to habitat loss and trapping for the pet trade, Moluccan cockatoos are an endangered species. Only captive-bred birds should be available to keep as pets. Moluccan cockatoos are one of the largest white cockatoos. They average about 20 inches in length from the beak to the tip of the tail feathers. This species requires a lifetime commitment as they can live up to 70 years. Sweet and affectionate may be understatements when it comes to describing the Moluccan. It's a bird that loves to be loved and really wants nothing more than someone (bird or person) to be with at all times. As a pet, the Moluccan tends to turn into a one-person bird. They are also very intelligent and thrive on challenges. Moluccans can learn to dance and do tricks and they can be quite the entertaining comedians when in a good mood. Moluccans are not the best talking parrot. They can mimic some sounds, though many owners say that it's more like yelling than talking. These birds are also screechers and will scream for attention, when unhappy, or no apparent reason. It's a loud scream, too, so they're certainly not ideal for anyone with neighbors who enjoy peace and quiet. While Moluccans are known to be extremely affectionate, some can be aggressive at times. This is particularly true of males as they age. A crank cockatoo can bite and this bird is designed to crack tough nuts, so it's beak is very powerful. For this reason, they're not a good pet for families with children. This species is easiest to recognize by the bright pink feathers that adorn the base of its crest. It's barely noticeable when the feathers are flat, but when the bird is excited, afraid, or angry, the crest will raise and show off its true beauty. Their crest is one of the fullest among cockatoos and is only rivaled by the umbrella cockatoo. Besides that pop of color on their heads, Moluccan cockatoos are primarily white with salmon colored feathers on their chests and wings. Underneath the wings is a beautiful pale yellow to peach color. Their beaks and feet are black but often appear gray due to the natural powdery down the bird's produce. In the wild, Moluccan cockatoos live in large flocks and they need a similar environment in captivity. This is likely why they bond so strongly with their owners. Don't get a Moluccan cockatoo unless you can be certain you'll have enough time allotted daily to meet your very social pet's needs. In reality, they are best for someone who's home most of the time. If your lifestyle does not fit this, you could consider two Moluccans. They will keep each other entertained and owners who have gone this route report that both birds still make excellent pets. Obviously, though, two of these feisty birds is an even bigger commitment than one. Moluccans will do best in the largest cage possible. In fact, if the bird's home can be more of a habitat or even a room, your bird will be even happier. The cage should be sturdy and able to withstand the cockatoo's more destructive nature. To curb some of this pent-up energy and natural instinct, plenty of toys and playtime are required. Any cockatoo also comes with a lot of powder. The birds produce it naturally as it helps with preening the feathers. Just be prepared to have a light dusting on any surface the bird is near and be ready to clean often. This can be an issue for some people with allergies as well. It's also a good idea to contact local breeders to see if you can spend some time with the bird you want to adopt. Getting to know someone that has experience raising Moluccans will help you decide if they are the right bird for you. It's always better to check out a bird in advance and decide against adoption than to take one home and become overwhelmed. Sadly, this species has a very high abandon rate because they do demand far more than people think. It's unfair to these very sensitive birds, and they are prone to self-mutilation when neglected. Just be sure you're fully prepared before adopting one. Like all members of the cockatoo family, Moluccans can suffer health problems if they gain too much weight. Owners need to keep an eye on the birds' fat intake and ensure a well-balanced diet. You'll want to feed your bird a diet that includes bird-safe fruits and vegetables like bananas, apples, carrots, and kale. All of this should be thoroughly washed to prevent parasitic infections. High-quality pellets and a little bit of seed mix for a treat helps ensure they're getting the nutrition they need. 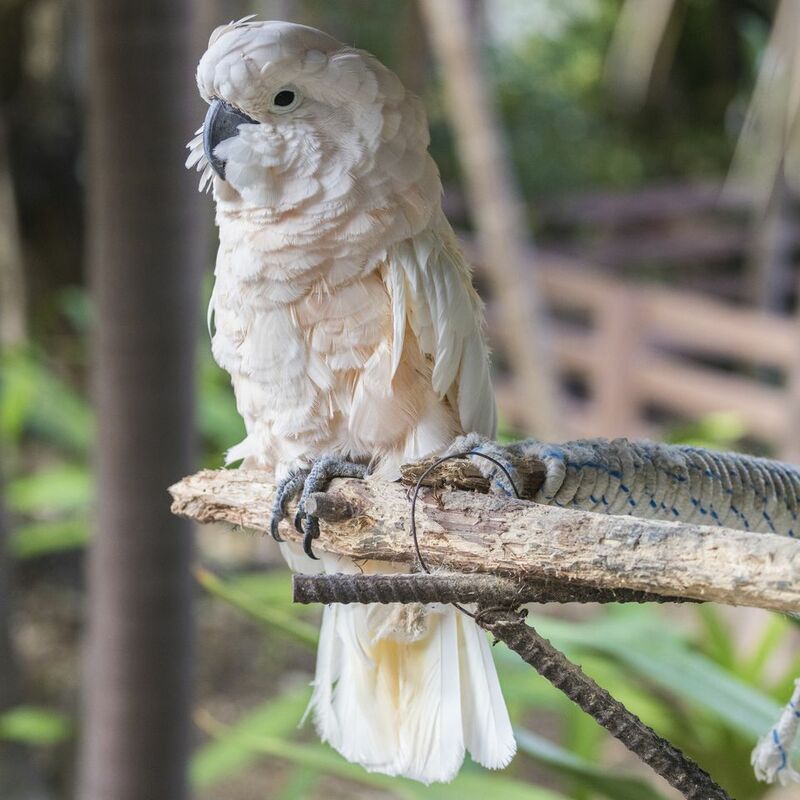 Moluccan cockatoos like to stay active, and they need plenty of exercise to maintain their mental and physical well-being. To let your bird play and stretch its muscles, give him between three and four hours outside the cage on a daily basis, though it doesn't have to be all at one sitting. Make sure this out-of-cage time is in a safe, enclosed area where your bird won't hurt himself, or worse, escape from the house. You can also play to his natural foraging instincts and hide food as a game. The bird will enjoy the challenge. You'll want to ensure your Moluccan cockatoo has bird-appropriate chew toys to exercise his beak on. A bored cockatoo is likely to chew on whatever's available, especially walls and furniture made of wood. The toys are a deterrent, though you will go through them quickly. Most cockatoo owners have a ready supply available as back-up. Otherwise, check out all of our other cockatoo species profiles.